We grow a variety if livestock. There was such a difference between chicken we grew and chicken we bought that we now grow all the meat we eat! For me, pork was the first meat I stopped eating. I could taste chemicals every time I tried it. And the smell of it cooking made my skin crawl. When we leased land we began with broilers. Then added egg layers. Then turkey. Then beef. The land owners said no to pigs. Actually, some said yes, others said no, and it was awkward. Not something we wanted in the middle. The time was right, and we moved to our own farm. Here on our own place pigs were one of the first to get here. Our idea was to do the same with them as everything else, to move daily in portable pens. 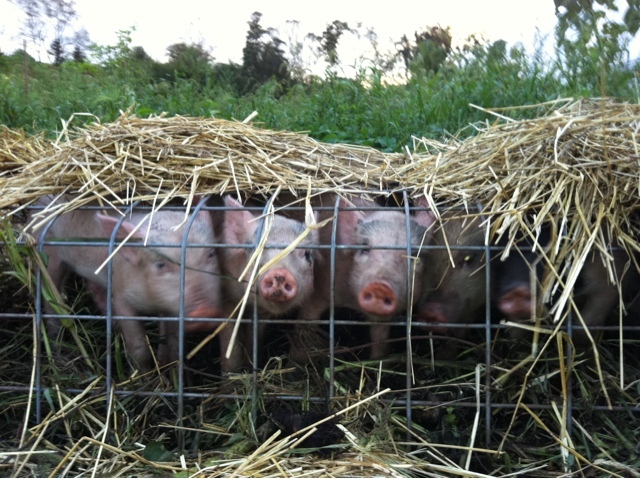 The breeder has become a friend, and called us a couple of weeks ago with an offer we could not refuse: 4 more pigs! Weaners, just off their momma. They are ours now, brought to the farm in a dog crate in the back of the truck. And installed in the pen with our other little ones, set to the task of clearing walkways between garden beds. The straw on top of their enclosure? The plan is for the piglets to tear out every thing growing, roots and all. Then pull the straw down and pack in place. And the pork? As with everything else we grow here, it tastes nothing like what you are used to. It is rich, full, a deep color and no trace of chemical to it. They can only do this while small, otherwise they might break out and eat all we have planted!